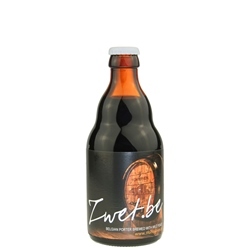 3 Fonteinen Zwet.be is an unusual ale from Brouwerij 3 Fonteinen, world-famous for the lambics they brew and blend: it's a Belgian Porter (ABV 7.0%) brewed with wild yeasts cultured from their lambic casks. Pouring near-black with a foamy tan head, its classic porter aromas of chocolate, roasted malt, and smoky coffee are complemented by sour cherry notes and a hint of vanilla. Taste is of dark fruit and chocolate -- malty sweet and smoky, there's enough tart acidity from the wild yeast for balance. A creamy mouthfeel and a dry finish with some hop bitterness augment the satisfying taste.